Writer, creator and Coheed and Cambria frontman Claudio Sanchez will make a guest appearance at Chicago’s Comic and Entertainment Expo April 13-15, where his publishing company, Evil Ink Comics, returns after a very successful visit in 2011. In addition to Evil Ink fan favorite titles The Amory Wars and Kill Audio, copies of the acclaimed Key of Z series have been collected in Trade Paperback, arriving just in time for C2E2! 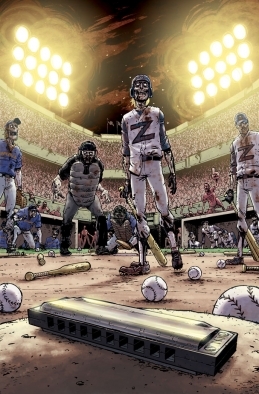 Created and written by Sanchez and Chondra Echert (Kill Audio) with interior art from The Amory Wars’ Aaron Kuder, Key of Z is the story of Nick Ewing, an executive security guard trying to survive in a post-zombie-apocalyptic New York City while seeking revenge on the warring gangs responsible for the death of his family. Sanchez, Echert and Kuder have scheduled signings at 5PM, Friday and Saturday, at Evil Ink Booth #335. Chicago Comic & Entertainment Expo (C2E2) is a pop culture event held at McCormick Place in Chicago, IL. Tickets for C2E2 can be purchased in advance at their website, www.c2e2.com.